Lesvos passenger and car ferry ticket prices, timetables, ticket reservations and information for ferries sailing from Lesvos to Chios, Piraeus, Sigri, Kalymnos, Kos, Rhodes, Samos, Karlovassi and Thessaloniki. Compare all available Lesvos ferry ticket prices in real time and book the cheapest available Lesvos car and passenger ferry tickets sailing to and from Lesvos, Chios, Piraeus, Sigri, Kalymnos, Kos, Rhodes, Samos, Karlovassi and Thessaloniki with Blue Star Ferries or Hellenic Seaways ferries online with instant confirmation. Book Lesvos Ferry Tickets with Blue Star Ferries or Hellenic Seaways for ferries sailing from Lesvos to Chios, Piraeus, Sigri, Kalymnos, Kos, Rhodes, Samos, Karlovassi and Thessaloniki online in advance to enjoy the cheapest available ferry ticket price. The price you see is the price you pay. There are no hidden extras or surprises such as added fuel surcharges or booking fees and we do not charge you anything extra for paying with a Visa Electron card. The price we quote you for your selected Lesvos passenger or car ferry ticket, onboard accommodation and vehicle type is all you will pay, and that's a promise. To obtain a Lesvos ferry ticket price and book your ferry ticket securely online please use the real time ferry booking form on the left. You are also able to add a hotel at your destination, or anywhere else, to your ferry ticket when completing your ferry ticket reservation. LESVOS or LESBOS lies among the north-eastern Aegean islands and close to the Turkish mainland. Lesvos is relatively isolated from other Greek islands with the nearest of any note, Chios to the south and Limnos to the north, both some distance away. Big and beautiful, Lesvos is the third largest Greek island after Crete and Evia and has, in parts at least, had its arms stretched wide to embrace the package tourist market. Lesvos also has its own airport that can take regular charter flights so the island doesn't have to rely on ferries to bring in the business. The Lesvos islanders also have a proud identity marked by long cultural traditions and that has helped temper the more downmarket demands of package holiday tourists. The main tourist attractions of Lesvos are the impressively varied landscape, the quaint hill villages and some splendid beaches. Lesvos has decent travel connections with a major airport just south of the capital Myttilini and daily ferries from Piraeus (Athens). Most arrive by charter flight direct to Lesvos or on a domestic flight from Athens. The ferry journeys are long and tedious, with journey times of up to 15 hours. There is a fast ferry in summer but this takes about seven hours and you arrive a little after midnight. Once on Lesvos the roads are good but the island is very large and car hire is recommended. There are daily ferries to Mytilini from Athens (Piraeus). The main ferries are operated by NES Lines and the journey time is lengthy, sometimes 12 hours depending on the boat and it is usually overnight. The ship leaves Piraeus in the evening and arrives in Mytilini early in the morning after calling at Chios. In high summer there are is a fast ferry from Athens to Mytilini operated by Hellenic Seaways with a journey time of seven to eight hours. SAOS operates a service from Lavrio, near the new Athens International Airport, to Sigri on the west coast of Lesvos where ferries also leave for Kos. There are also ferry connections to Thessaloniki and Ayvalik (Turkey) as well as to other Greek islands such as Chios, Ikaria, Kalymnos, Kos, Limnos, Mykonos, Rhodes, Samos, and Syros. There are also several ferry services to Turkey (Ayvalik). In the high season there are boats every day but the service is reduced in the winter to a few times a week in good weather. The crossing from Lesvos to Turkey takes about 90 mins. The ferry does take cars,but it is fairly small so advance booking is recommended. Summer ferry schedules may not be confirmed until April or May, and not published until then. The information is as accurate as I can make it but note that ferry schedules can change at any time. The capital of Lesvos is Mytilene (Μυτιλήνη), at the east end. A busy town as it concentrates the hospital, the university, the port, the airport, the court, the prefecture and other administrative headquarters. Kalloni is the second-in-size town, located in the center of the island, at the north of the greater of the two gulfs (thus called "Gulf of Kalloni"). Molivos, the ancient Methymna (spelled also as Mithimna), the most important destination for a visitor, because of its attractions: the Gattilusi Castle and the whole preserved traditional architecture. It is one of the two lungs of tourism in Lesbos, the other one being Eressos. Eressos is a small dale town at southwest paving the way to the sandy beach, or Skala Eressou, thus being mostly a summer resort. Notably, its fame as the birthplace of Sappho attracts some lesbian (homosexual) couples, but they consist a part of the whole number of Eressos' visitors, as it is a place too beautiful to become isolated. Plomari at the south coast in the middle of the two gulfs' openings, is the homeland of Ouzo, the well-known Greek alcoholic beverage. Mandamados, at the northeast, for the ceramic art tradition and the locally produced dairy products. Agiasos, the picturesque village while ascending onto Olympos. Roads on Lesvos are generally good but the island is very large and mountainous and routes are rarely straight so driving can be tiring. There are no expressways but roads are usually uncongested. Road between resorts are wide but in towns and villages they can narrow very quickly and the surface can deteriorate. Best Price Guarantee - We always offer you our lowest available Blue Star Ferries or Hellenic Seaways passenger and car ferries ticket price to and from Lesvos. There are no hidden extras or surprises such as added fuel surcharges or booking fees and we also we do not charge you anything extra for paying with a Visa Electron card. The price we quote for your selected Lesvos ferry ticket, onboard accommodation and vehicle type is all you will pay, and that's a promise! 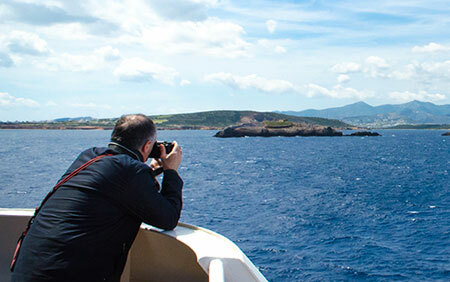 In the unlikely event you find the same all inclusive Lesvos ferry ticket cheaper in the brochure of any other tour operator we promise that we will do our best to beat that price or offer you the choice of requesting a refund. To book Lesvos car and passenger ferry tickets please click here. At ferryto.co.uk you are able to obtain live Lesvos ferry ticket prices, check availability and book car and passenger ferry tickets to and from Lesvos at our lowest available ticket price. Ferryto.co.uk is part of the world's largest online ferry ticket distribution network providing the ability to book over 80 major European ferry operators including to Lesvos and to over 1,200 other ferry routes throughout the UK, France, Spain, Ireland, Holland, Eastern Europe, the Mediterranean, the Baltic and North Africa.